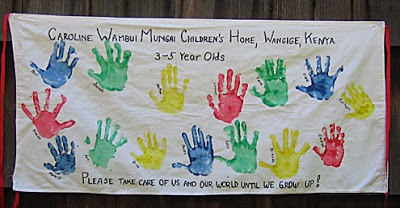 This blog is dedicated to all the women, men and children, the organizers and planners around the world, who's work and contributions continue to make Justine's vision a reality. Justine's first Ribbon panel, embroidered . with names of people she loved. 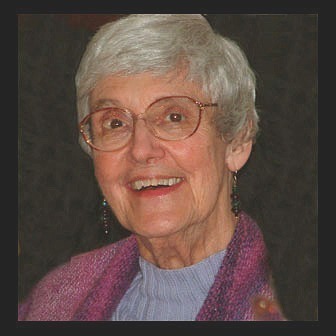 Mary Frances Jaster in Denver, became the National Coordinator for the Washington, D.C. event, assisting the State Coordinators who were overseeing the thousands of panels needed, and being created for The Ribbon. 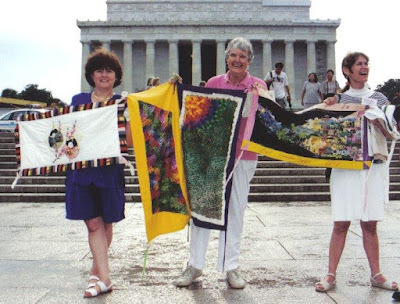 The creators of the panels included quilters, embroiderers, children, seniors, artists, housewives, religious orders, doctors, farmers, athletes, and people from many walks of life and faiths. Many towns and organizations had Ribbon joining events with the panels. 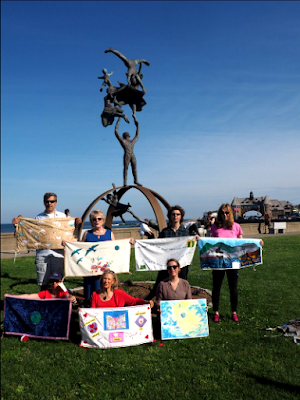 A Ribbon was created by the Sonoma County Women's Action for Nuclear Disarmament (WAND) for a local event in Santa Rosa, California, where 600 panels were displayed. Also a display of panels in 1984, surrounded the 3 mile circumference of Lake Merritt in Oakland, California. The Ribbon Starting in California (YouTube video). Produced by Barbara Hirschfeld; Sonoma Chapter of Women's Action for Nuclear Disarmament (WAND) and KRCB – Channel 22 - Petaluma, California. Representatives, and members of the media. Merritt in white on the left. 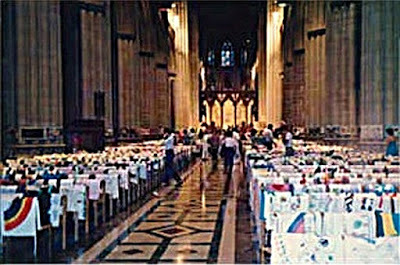 A 10-15-mile route through the heart of Washington, D.C., had to be designed and planned, meet with Metropolitan Police, Capitol Police, Secret Service, Pentagon Police and the National Park Service to discuss and obtain numerous permits to stage the event. displayed beside the Lincoln Memorial Reflecting Pool. National Mall at the U.S. Capitol Building. The Ribbon then went past the Lincoln Memorial, along the south side of the Lincoln Memorial Reflecting Pool continuing east on the National Mall, to wrap around the city block containing the U.S. Capitol Building. 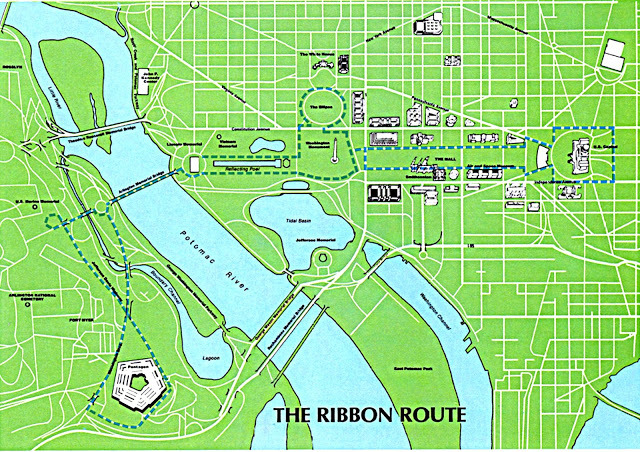 The Ribbon returned going west on the north side of the National Mall, going around The Ellipse by the White House, continuing past the Reflecting Pool to the Lincoln Memorial, crossing the Potomac River again, and returning to the Pentagon. Lucille Miller (white hair), Merritt right of small child. 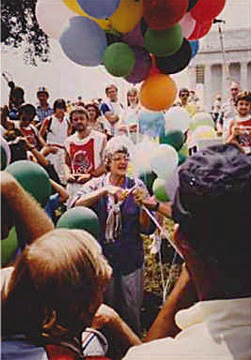 In 1986, Merritt's sister June Thompson from Palo Alto, California, an anti-nuclear activist along with a number of the five hundred participants in the Great Peace March for Global Nuclear Disarmament, carried Ribbons as they walked thirty-seven hundred miles across the continental United States, for action on global nuclear disarmament. Then on August 5, 1986, fifty Ribbon panels were taken to a demonstration at the Nevada Nuclear Test Site. Later that month, on August 31, a group of four hundred people gathered to surround the Horse Creek Missile Silo near Cheyenne, Wyoming, and with some participants showing Ribbon panels as part of their protest of the MX missile. Also in 1986, 10,000 Ribbon panels were created and tied together linking the Bha'i religious temple in Sydney, Australia to the ocean. In South Africa, Black Africans and white mothers unite using Ribbons to tell their government they don't want their children killing each other. Ribbons were used to protest the razing of the Japanese Ikego Forest, and are displayed in Zushi, Japan for the environment, at the Ikego Forest. In New Zealand, Ribbons connect the United States and the Union of Soviet Socialist Republics (USSR) embassies. World Leader Mikhail Gorbachev of the USSR is presented a Ribbon by Justine Merritt. In Okinawa｜沖縄 Japan, during 1987, Ribbons were used in surrounding the largest military base in the Pacific arena. In Holland, Ribbon panels were used to connect the US and USSR embassies. On the island of Sri Lanka. the religious groups of Tamli, Sinhalese and Christians, joined together and exhibited Ribbon segments. 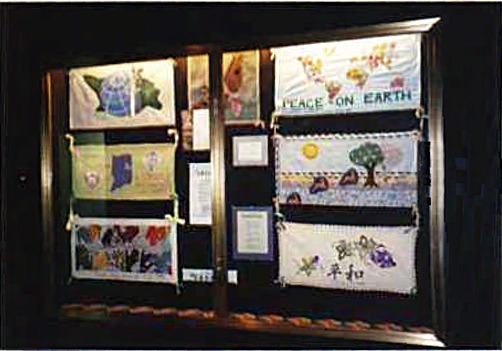 In the Middle East 1988-1989, the Interns for Peace Calendar shows Ribbons made by Arab and Jewish children. Ribbons were made at the West Bank and Gaza Strip for a peace event. children taken and made to fight in a war. Civil war in Liberia claimed the lives of almost 150,000 people—mostly civilians—and led to a complete breakdown of law and order. Fighting began in late 1989, and by early 1990, several hundred deaths had already occurred in confrontations between government forces and fighters. It displaced scores of people, both internally and beyond the borders, resulting in some 850,000 refugees in the neighbouring countries. 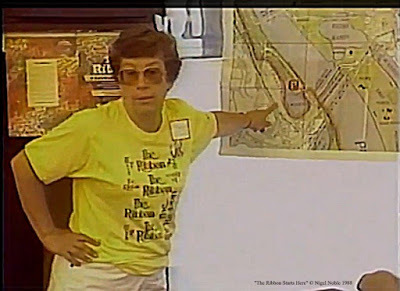 United Nations Mission in Liberia A documentary video The Ribbon In South Africa was created in 1986, and is available in the OCLC WorldCat library system. The documentary follows the anti-apartheid movement among women in South Africa, and how black and white mothers used the Ribbon project, creating panels and having Ribbon events in front of government buildings to protest their sons going to war and killing each other in South Africa. The ending of the cold war was in the late 1980's, with former Russian President Mikhail Gorbachev bringing the cold war to a peaceful end, resulting in his receiving the Nobel Prize for Peace in 1990. Proliferation Treaty of Nuclear Weapons conference, 1990. In New York State, the coordinators had collected an international collection of Ribbons. 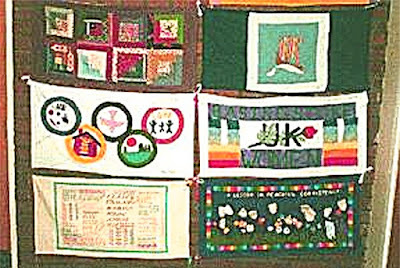 New panels continued to be created for Ribbons to be displayed at various environmental and peace events. 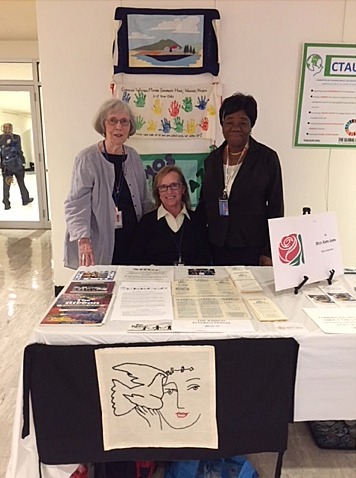 Sister Mary Beth Reissen, President of The ﻿United Nations Non-Governmental Disarmament Committee  referred New York Ribbon Coordinators, Michele Peppers and Hannah Wassermann to the United Nations exhibit committee. After several meetings, the committee requested an exhibit of Ribbons for the 1990 Conference being held in Geneva, Switzerland for the Treaty on the Non-Proliferation of Nuclear Weapons. During the conference, Ribbons were displayed in the Palais des Nations, for the Nuclear Non-Proliferation Treaty (NTP) Conference. Ribbons were also exhibited in London at the Houses of Parliament. 1990s, various Ribbons were displayed. The Ribbon evolved into The Ribbon International, and in 1991 became a United Nations Non Governmental Organization (UN NGO DPI Organizations) in association with the Department of Public Information. 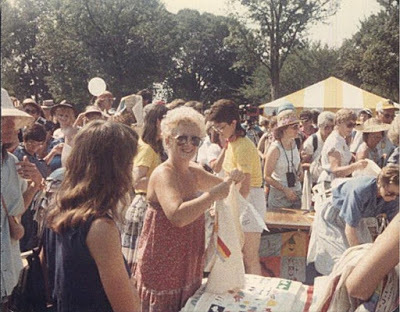 The grass roots project starting in 1982 and the movement of The Ribbon event in 1985, has spread around the world, promoted by people and organizations concerned with nuclear weapons, the environment and peace. UN Comprehensive Test Ban Treaty Conference. nuclear weapons conference,  at the United Nations Headquarters in New York, Ribbons were exhibited at the United Nations during the Comprehensive Test Ban Treaty Conference. 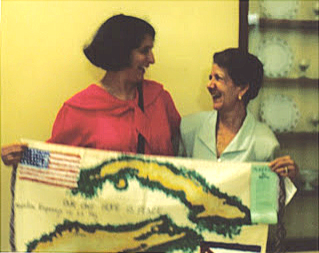 Included were panels created by Iraqi and American children. New York State Museum in Albany has an International Ribbon exhibit. United Nations Conference on Environment and Development (UNCED), "The Earth Summit," focused on the environment and sustainable development. 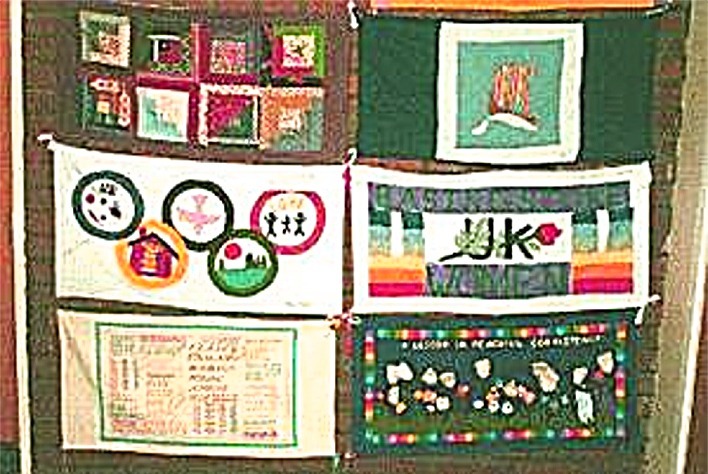 Ribbons were also displayed in 1993, at the first United Nations World Conference on Human Rights. Vienna, Austria, June 14-25. The human rights conference was attended by 171 State or Government heads, focusing as a international community developing a common plan for the strengthening of human rights work around the world. In the Republic of Singapore in 1993, The Ribbon concept inspired a creative Ribbon contest focusing on the environment. 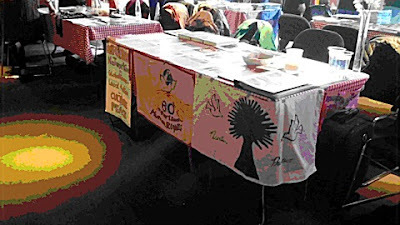 In Chicago, Illinois The Ribbon was a co-sponsor of the Parliament of World Religions, to promote understanding and cooperation among religious communities and institutions. 1995 marked the 10th anniversary of The Ribbon. Justine Merritt returned to Washington, D.C., along with Michele Peppers and Monica Willard, including 150 people from Huntington, New York, Maryland and Washington, D.C. to mark the 10th year anniversary of The Ribbon event and the 50th anniversary of the nuclear bombing at Hiroshima and Nagasaki. 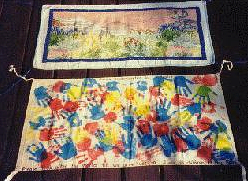 The Ribbon panels and segments, were joined together and carried over land and under water; with the help of scuba divers at the Dolphin Reef, to connect Egypt, Israel and Jordon, in a showing of world peace. The Israeli children's TV program Zap was the sponsor of The Ribbon event, a video Zap for Peace (YouTube video) was created and broadcast by the Israeli Broadcast Authority. kneeling in front, Keiko Chevray, UN NGO representative of IHAN. 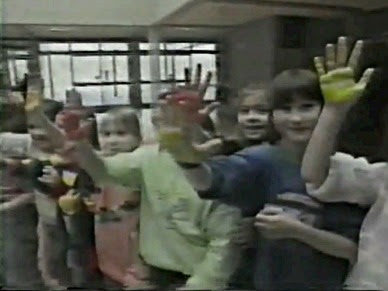 In 1997, the country of Estonia on the Baltic Sea, used Ribbons to celebrate peace. 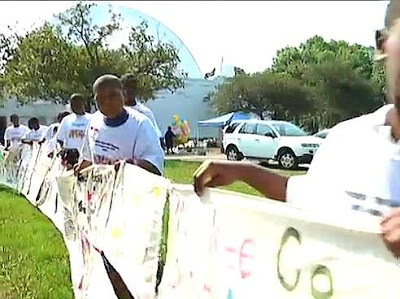 Ribbons are taken to the Caribbean country of Haiti to promote a culture of peace. In Magdeburg, Germany, the Mayor inspires the city's population to create and display Ribbon panels for the United Nations Human Rights Day on December 10th and other occasions. The Bonadssamlingen Museum in Stenstorp, Sweden exhibits Ribbons. Museum has a collections of Ribbons. Ribbons were displayed at the UNESCO Action Plan on Cultural Policies for Development conference in Stockholm, Sweden, March 30 - 2 April, 1998. The Power of Culture – The Intergovernmental Conference on Cultural Policies for Development, held in Stockholm, was designed by UNESCO to transform the ideas from the report Our Creative Diversity into policy and practice. This report was presented in 1995 by the World Commission on Culture and Development, established by the United Nations and UNESCO and led by Javier Pérez de Cuéllar. 1998 was also the United Nations International Year of the Oceans, people were encouraged to create Ribbons, through out the year. In its role as the designated lead agency for the year, UNESCO coordinated and organized the bulk of the campaign’s scientific debate and public awareness activities. Many Member States, as well as United Nations Programmes and Specialized Agencies with mandates in the field of marine affairs, are also expected to drive issue-or country-focused promotional campaigns on ocean-related matters throughout 1998. 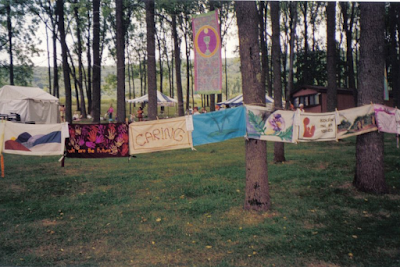 Ribbons are displayed annually at the World Peace Society Festival, Amenia, NY, Aug. 1999. In the original Japanese version of May Peace Prevail On Earth, the character for Earth includes not only humankind, but Life in all Realms of Creation. When we speak the words, May Peace Prevail on Earth imagine that the frequency and energy field of Love, Peace and Harmony reaches the kingdom of plants animals and all of Creation including our solar system, the cosmos and the Universe at large. Human Rights Day is observed by the international community every year on December 10th. This observation commemorates the day in 1948 that the United Nations General Assembly adopted the Universal Declaration of Human Rights. 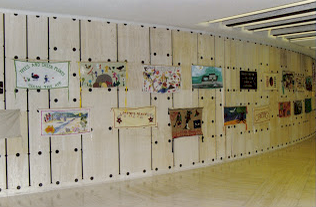 In 1999, Ribbon panels were displayed for Human Rights Day in Copenhagen, Denmark. 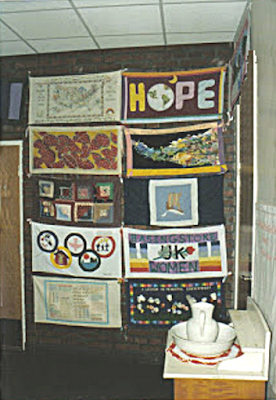 Ribbons were also exhibited in the Netherlands at the Hague Appeal for Peace (HAP99). Ribbons were created for the International Year of Older Persons. 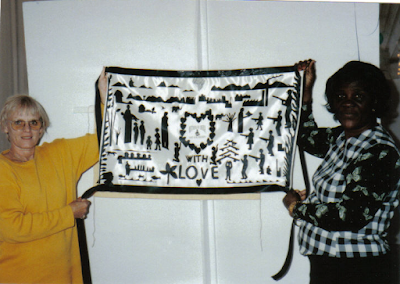 In October 2000, a Peace Ribbon was presented by Loretta Kepler to the wife of the Rev. Hector Mendez, minister of the First Presbyterian Church of Havana, Cuba. "I wasn't expecting to speak in front of the whole congregation, but that Sunday the Reverend Mendez introduced our group and brought out the Ribbon. With words in Spanish, that were pulled from my past I said that these were two islands in the same sea, and that our one hope as for peace. People cried." Church Women United (CWU) initiates The Ribbon as part of their celebrated days of prayers for peace such as World Community Day. The event is organized by CWU, an ecumenical organization of Christian women who are working to strengthen families. World Community Day focuses on justice and peace around the world, and it is typically celebrated on the first Friday in November. Merritt at the Vatican, Rome. October 17, 2001. Ribbons have been given to the New York City Council, including noted people such as, former Russian President Mikhail Gorbachev, and Indian Prime Minister Rajiv Gandhi. 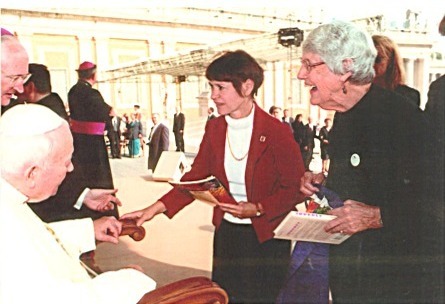 Founder Justine Merritt and Michele Peppers present a Ribbon panel to Pope Saint John Paul II in Rome, in honor of the United Nations resolution for the Decade for a Culture of Peace and Non Violence for the Children for the World (2001-2010). with 60 schools involved in the special event. 2009. 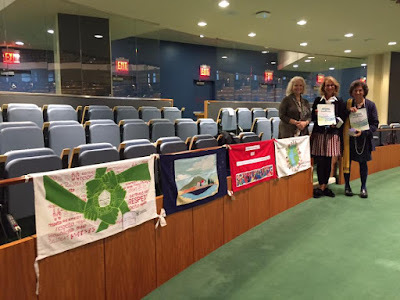 The UN NGO York City annual Ribbon Committee in New York joined, (2002-2012) Ribbons with the Interfaith Prayer for Peace, starting from the United Nations Headquarters to the World Trade Center site. ﻿﻿﻿After September 11, 2001, Merritt called The Ribbon, The Ribbon of Tangible Hope, she wanted a Ribbon long enough to stretch from the United Nations to the World Trade Center Memorial site, and to a Muslim shrine. 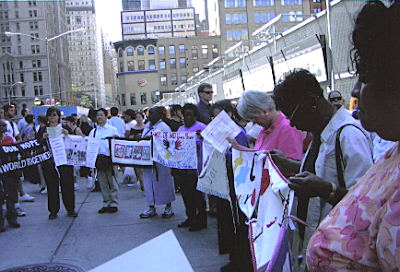 On September 11, 2003, Ribbons panels are joined and an Interfaith Prayer for Peace is given, in the Dag Hammarskjöld Plaza, New York City, New York. Dag Hammarskjöld was the second Secretary-General of the United Nations, from April 10, 1953 until September 18, 1961, when he died in a plane crash while on a peace mission in the Congo. In 1961, he received the Nobel Peace Prize "posthumously in gratitude for all he did, for what he achieved, for what he fought for to create peace and goodwill among nations and men." 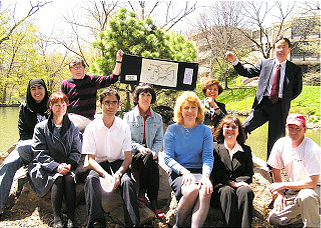 In the state of Pennsylvania during 2004, a tree planting peace event took place, with faculty and students of Pennsylvania State University, commemorated the event with a Ribbon panel. The Power of Culture UNESCO 2004 conference, hosted by the Government of Sweden, was attended by ministers and officials from nearly 140 of UNESCO's 186 Member States (190 Member States and 6 Associate Members), and, in addition, by invited persons active in cultural fields all over the world – in total there were about 2,200 participants. 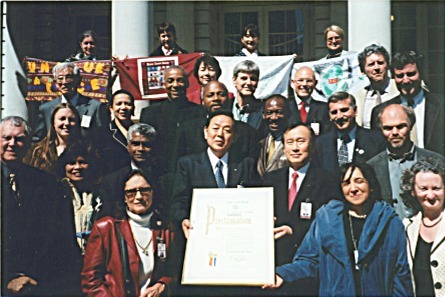 The Ribbon Committee worked with The New York City Council on "Nuclear Weapons Abolition Day" (4/28/04), representatives Mayor Iccho Itoh from Nagasaki and Mayor Tadatoshi Akiba﻿﻿﻿﻿﻿﻿﻿﻿﻿ from Hiroshima, Japan, along with a group of approximately 30 mayors from around the world attended the UN related nuclear conference. 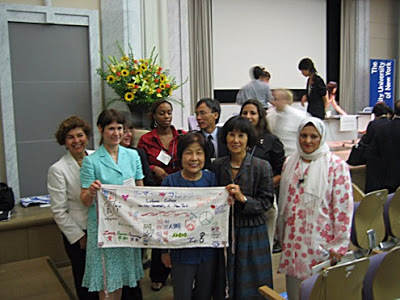 Mayors for Peace is an organization that ﻿was started by Hiroshima Mayor Takeshi Mraki, with membership of over 5,000 Mayors worldwide to work with mayors on a global scale for the abolition of nuclear weapons and peace. Gift Ribbon panels and the proclamation were given to representatives for Mayors for Peace, New York City Council and September Eleventh Families for Peaceful Tomorrows. Miyoko Wantanabe (middle of panel), a Hiroshima survivor and President of the Hiroshima Peace Ribbon Association is presented with a Ribbon created by Lehman College Students. The Ribbon has messages of peace in many languages and will be added to the Hiroshima Museum collection. the Decade for a Culture of Peace and Non Violence for the Children of the World. 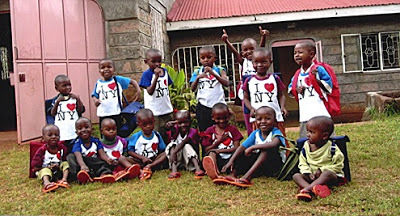 care of this world and us until we grow up!" 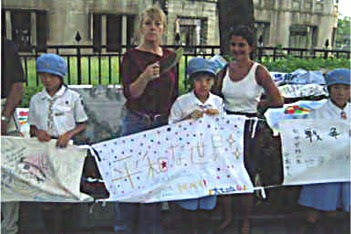 The objective of the International Decade for a Culture of Peace and Non-Violence for the Children of the World, 2001–2010, was to strengthen ﻿further the global ﻿movement for a culture of peace following the ﻿﻿﻿﻿observance of the International Year for the Culture of Peace in 2000.
two Girl Scouts at the A-Bomb Memorial. the two Girl Scouts at the A-Bomb Memorial. During Sept. 20 - Dec. 8. 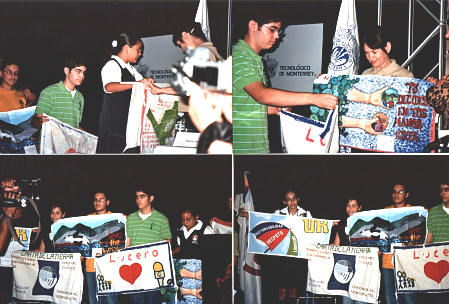 2007, in Monterrey, Mexico a UNESCO (United Nations Educational, Scientific and Cultural Organization); Universal Forum of Cultures, was held. Ribbons were created throughout the city of Monterrey before the forum. The event was organized by Alicia Martinez, the Coordinator for The Ribbon in Latin America, a school principle, to focus on a Culture of Peace. 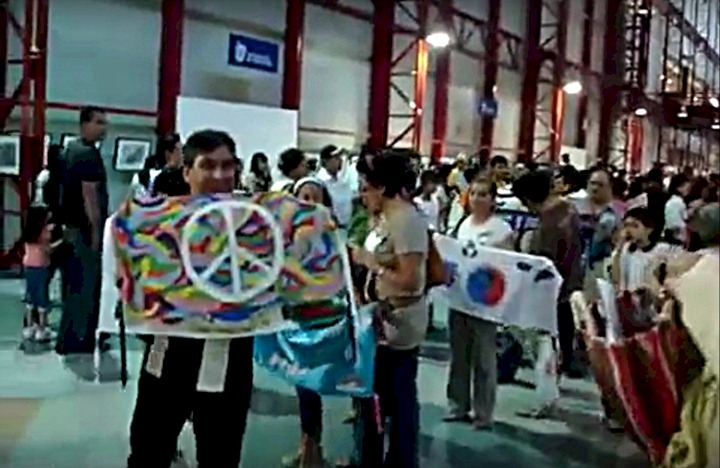 The 2007 Monterrey Forum provided the participants with the opportunity to experience a wide array of Cultural Expressions from all continents of the world. 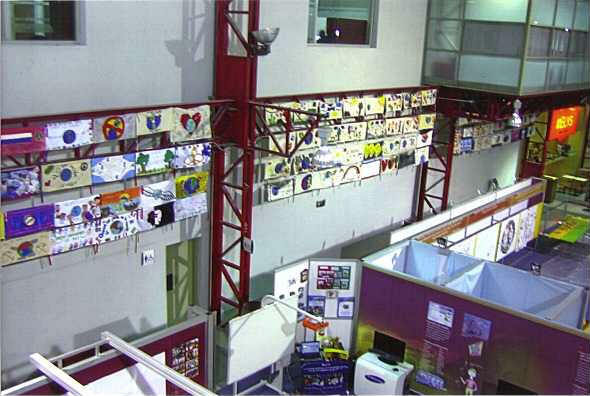 Ribbon panels hanging in exhibiting area. More than 1,000 single events were presented, during the 80 days of the event, involving 189 companies from more than 75 countries. Ribbon workshops were held at the forum as well. Thousands of Ribbons were created and hung in the exhibiting areas, panel discussion and Ribbon joining event with students participating was held throughout the conference area. 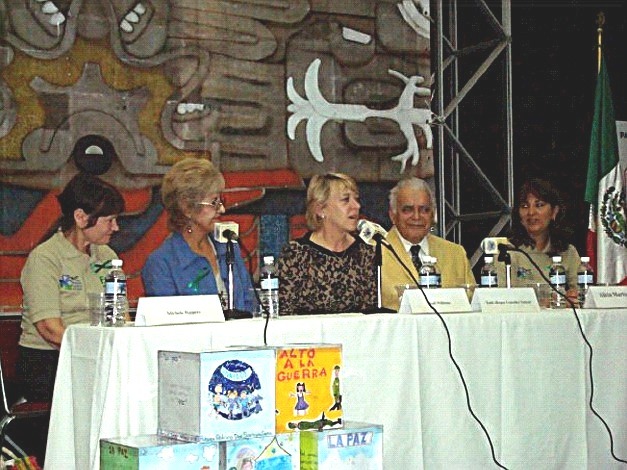 Nobel Laureate, Jody Williams; and Alicia Martinez (organizer of the Ribbon workshops, display and event) participated in joining the panels to create The Ribbon. Michele Peppers, Executive Director of The Ribbon International, attended the event and gave a presentation. A number of videos were filmed and can be located and viewed in the bottom section named "Videos" - UNESCO. In August of 2008, peace banners were created for the November Scooter Foundation's Third Annual Freedom from Gun Violence Peace Walk (YouTube video) in Milwaukee, Wisconsin, and filmed by New Moon Productions. 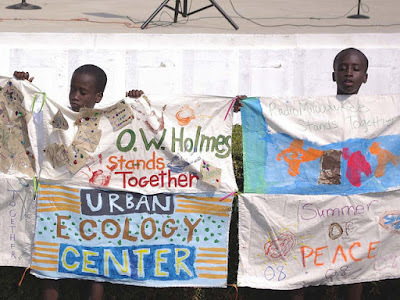 In preparation for the Peace Walk and launch of Stand Together Milwaukee - STM, Scooter Foundation, & community members gathered on June 2 at the Washington Park Urban Ecology Center to create banners to join The Ribbon International. STM and community artist volunteers decorated banners with inspirational images of "what they most want to protect." 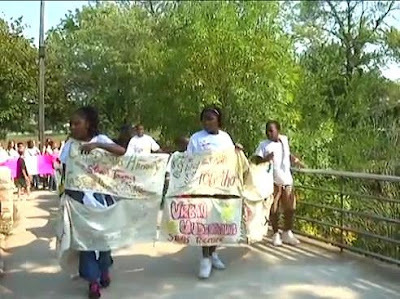 All of the banners were then tied together with colorful ribbons, creating a 40-yard long community banner representing Milwaukee standing together in peace and unity, to be carried in the Peace Walk. their combined symbols of peace. The group becomes an immediate member of The Ribbon International Project – joining participants from across the globe – all working to promote peace. 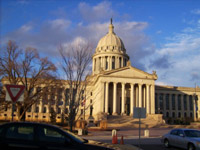 The Ribbon of Tangible Hope in the state building in Oklahoma City in honor of the fifteenth anniversary for those who died in the Alfred P. Murrah Federal Building. 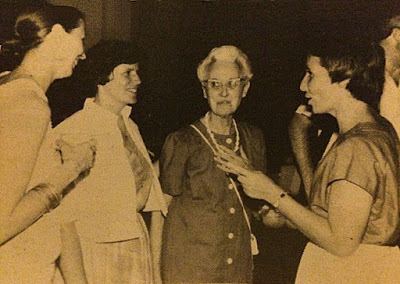 Over the years, Church Women United has wrapped The Ribbon around numerous sites. The Ribbon International Project goes by the United Nations and "Ground Zero" on September 11, 2010, for the annual Ribbon joining and Interfaith Prayer for Peace. 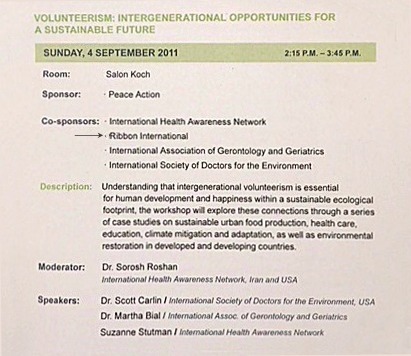 On September 3-5, 2011, in Bonn, Germany, The Ribbon International participated in the 64th Annual UN DPI/NGO Conference: Sustainable Societies. Responsive Citizens, associated with the UN Department of Public Information (DPI). The conference will seek to highlight effective ways in which civil society can contribute to creating and maintaining sustainable societies. 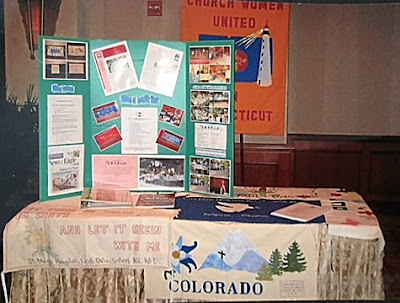 In December of 2011, the 70th anniversary of Church Women United was held at the Bally's Hotel in Atlantic City, New Jersey. The theme of the meeting was a "Legacy and Light," with Ribbons being held in prayer and on display. On August 5th 2012, Pax Christi New York City hosted the 67th Memorial Service for the Hiroshima and Nagasaki nuclear bombing, with a speech, prayer and public witness to express opposition to nuclear weapons. 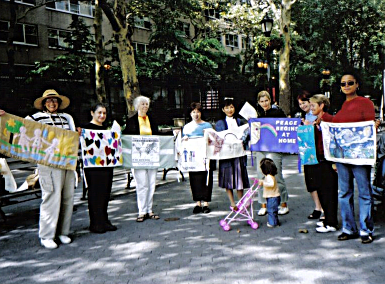 The Ribbon International participated in the events and vigil walk, displaying Ribbon panels. other two people holding Pax Christi sign unknown. June Tano, all others unknown. "The International Day of Peace ("Peace Day") is observed around the world each year on 21 September. Established in 1981 by unanimous United Nations resolution, Peace Day provides a globally shared date for all humanity to commit to Peace above all differences and to contribute to building a Culture of Peace." "From education to the arts, social justice to sports, health to the environment, neighborhood issues to service for others, there are many ways to participate in Peace Day! We invite you to create a public or private activity related to peace, spread the word about Peace Day and/or attend an event in your community." The below photos are from the International Day of Peace event, September 21, 2013, at the Band Shell, Central Park, New York City. Ribbons were displayed, and then joined together, the Interfaith Prayer for Peace was read. On August 4th, 2014 a Peace event and walk to St. John's Lutheran Church took place in front of the Ghandi statue, Union Square Park, New York City. This event was in honor of Mohandas Karamchand Ghandi (1869–1948). Gandhi is widely recognized as one of the twentieth century's greatest political and spiritual leaders. Honored in India as the father of the nation, he pioneered and practiced the principle of Satyagraha—resistance to tyranny through mass nonviolent civil disobedience. 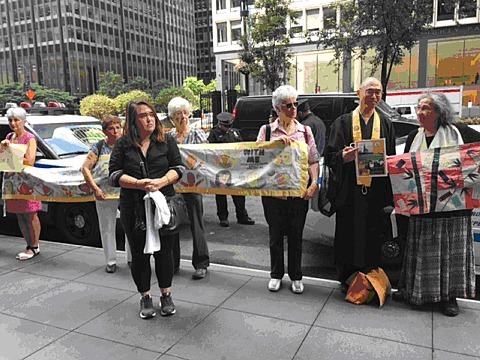 Also another event took place in New York City on August 4, 2014, which is in concert and solidarity with annual events held in Washington, D.C., organized by Dorothy Day Catholic Worker and their co-sponsoring organizations. The events in Washington, D.C. take place in front of the White House and Pentagon, which have occurred for close to 40 years. 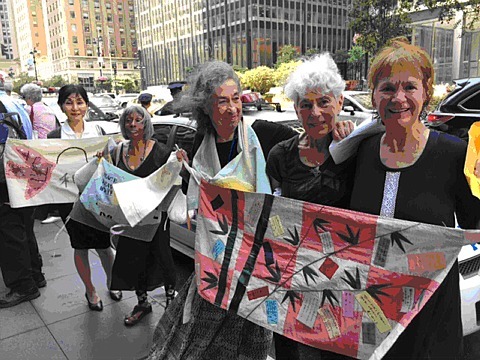 On August 5 (6 in Japan) 2014, the coalition of peace groups, organized by the Manhattan Project for a Nuclear Free World, started an annual event to visit the Japanese Consulate in New York City. 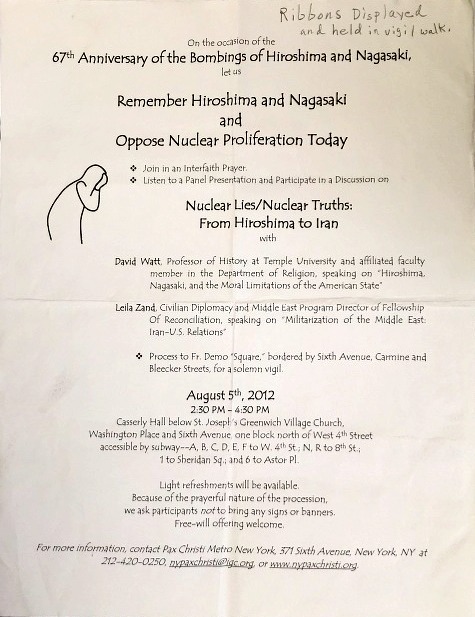 The peace groups join together, taking to the consulate a bouquet of flowers, and a letter of apology for attacking Hiroshima and Nagasaki with atomic bombs, the worst weapons of genocide. On Sunday, September 21, 2014 over 400,000 people gathered in Manhattan, New York, N.Y., for the historic People's Climate March, (YouTube video) was filmed by Scott McPartland that was being held before a summit of 120 world leaders on climate change at the United Nations. 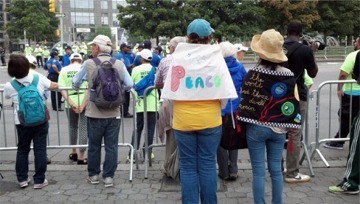 The two mile march started in Central Park West and ﻿Columbus Circle, weaving around the center of Manhattan on sixth avenue, passing by Ribbon panels, which were worn by members of The Ribbon International committee as they joined the thousands of people marching in the People's Climate March. Other organizations carried Ribbons, such as the Gray Panthers and Unitarian Universalist Congregation. 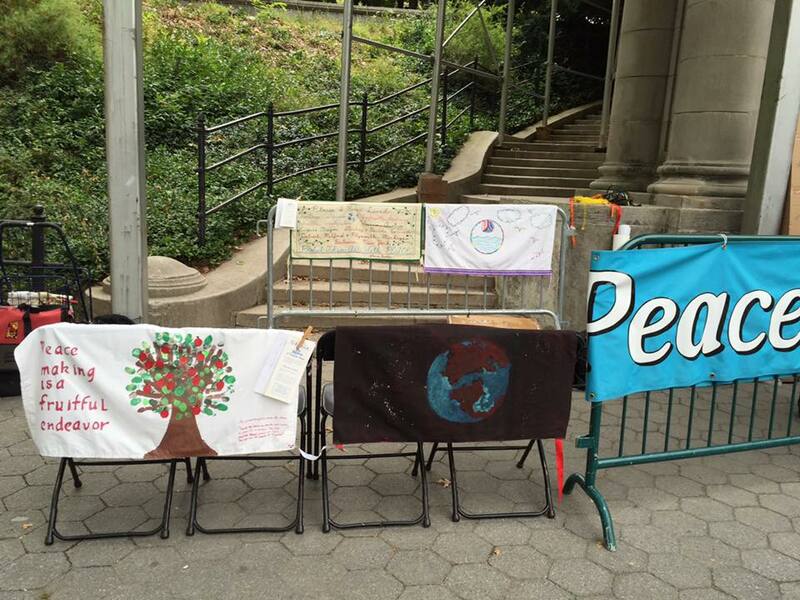 The United Nations International Day of Peace, September 21, 2014 was also taking place in Central Park. "Each year The International Day of Peace is observed around the world on 21 September. 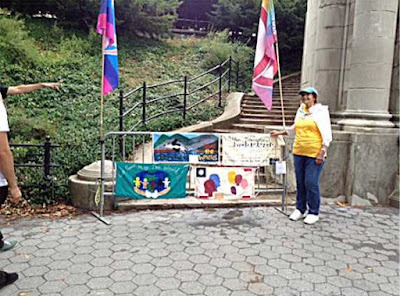 The Vigil for the International Day of Peace, has been held annually since 2002 in Central Park, NYC. It is a grassroots effort sponsored many United Nations Non Governmental Organizations, dedicated to promulgating peace through participation in art, song, dance, music, prayer and ceremony. Rev. Susana Bastarrica is the Founder/ Organizer of the event. In 2001, the United Nations unanimously passed a resolution (55/82) designating September 21st of each year as an International Day of Peace. The intention of this resolution is to have the entire world observe a full day of "global ceasefire and nonviolence." International Day of Peace is the "Right of Peoples to Peace." "The Declaration on the Right of Peoples to Peace," recognizes that the promotion of peace is vital for the full enjoyment of all human rights." 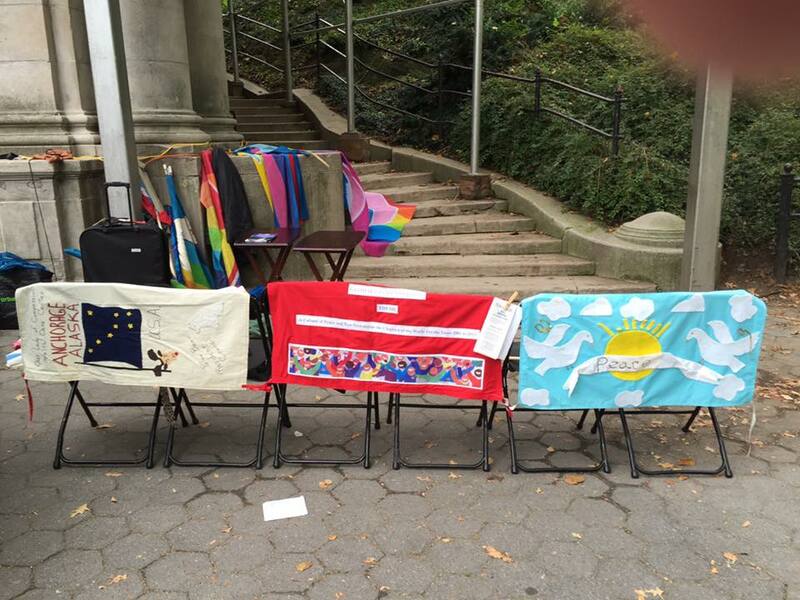 Ribbons were exhibited all day, for the event at the at the NYC Central Park Bandshell. A detailed description of the August 5, 2015 event, "Coalition of Peace Groups Gather at Japanese Consulate," with photos, was created by Japan Culture NYC. The article contains a description of Article 9 of the Japanese Constitutions, which the coalition emphasized their support for retaining Article 9. 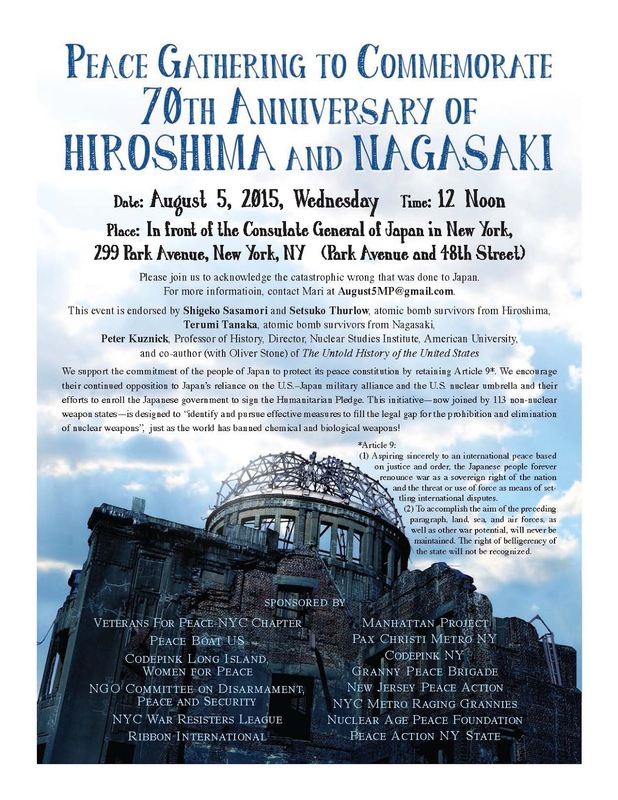 Another event took place on August 6th, 2015 at the Unitarian Universalist Church, Manhasset, Long Island, commemorating the 70th anniversary of Hiroshima and Nagasaki. 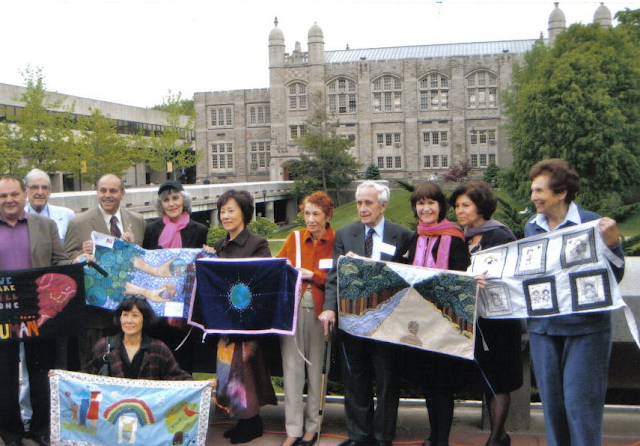 Members of The Ribbon International attended, displaying Ribbon panels. On September 20, 2015, the Vigil for the International Day of Peace, a day long event displaying Ribbons, was held at the Bandshell, in NYC Central Park. 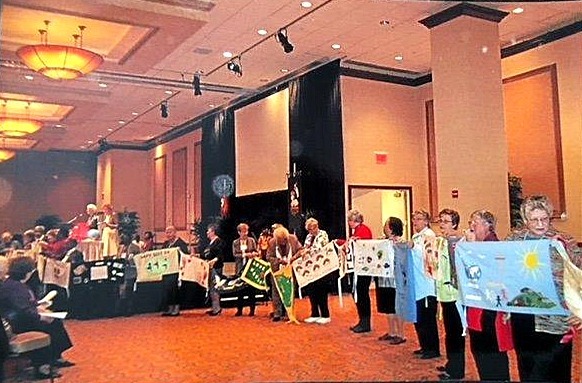 The Ribbon panels were held by participants with the reading of the Interfaith Litany for Peace in the afternoon. Children from Folklore Hispano Bensonhurst helped with holding The Ribbons while the Interfaith Litany for Peace was read. Ribbons were held on Raragansett Beach, Rhode Island, on June 21, 2016 to observe the solstice at the Tsunami of Love event organized by artist Mimi Sammis. Over 100 people circled her 20 foot Dance of Peace sculpture as we sent our love and prayers to the world. 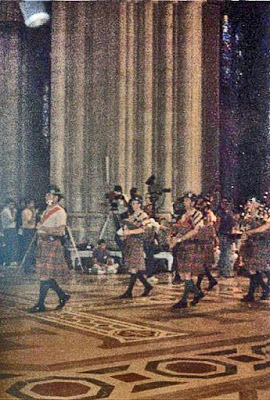 In 1999, a 4 foot Dance of Peace was a part of her United Nations exhibit, A 1000 Years of Peace. In this photo are people from 4 different states and 2 people from Europe. 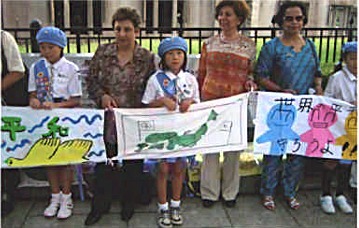 A Peace gathering on August 4, 2017, was held in front of the Consulate General of Japan, York City, to commemorate the 72nd Anniversary of Hiroshima and Nagasaki. An open letter was given to the Consulate of Japan concerning the importance of abolishing nuclear weapons globally toward a more peaceful world, from concerned Peace organizations and citizens of the United States. 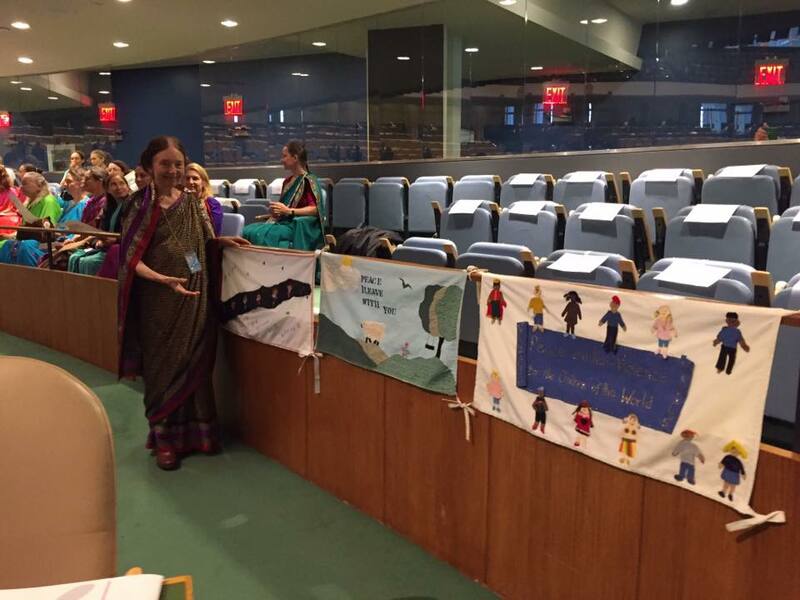 Ribbons were displayed at the UN General Assembly High Level Forum on the Culture of Peace, September 7, 2017. On September 13, 1999, the UN GA adopted, by consensus and norm setting resolution 53/243 on the Declaration and Program of Action on COP. Among other things, it provided the driving force for the effective observance and realization of the objectives of the UN declared International Decade for Culture of Peace and Non Violence for the Children of the World (2001-2010). 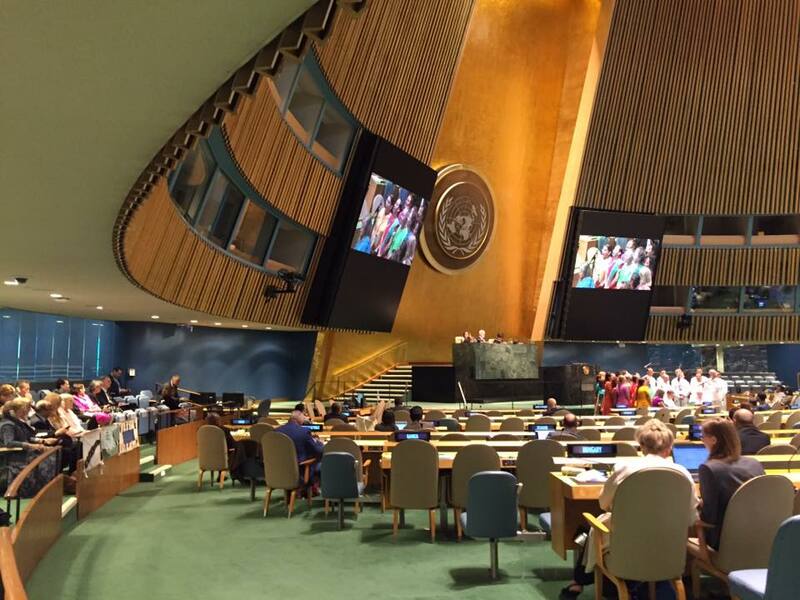 Asserting and re-affirming the commitment of the totality of the UN membership for building the Culture of Peace, the UN GA has adopted resolutions on the subject every year since 1997. Under-Secretary-General and High Representative of the UNAKC (The Department of Peacekeeping Operations), has devoted many years as an inspirational champion for sustainable peace and development and ardently advancing the cause of the global movement for the culture of peace that has energized civil society all over the world. 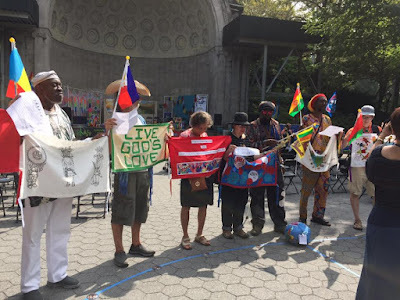 On Sunday, September 17, 2017, the annual International Day of Peace commemoration was held at the Central Park Bandshell, New York City. The Interfaith Litany is being read. holding blue Ribbon next to her, remaining people unknown. 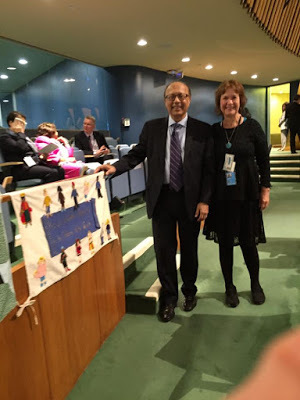 ﻿﻿ The Ribbon International is a member of Abolition 2000, which is a network of over 2000 organizations in more than 90 countries world wide working for a global treaty to eliminate nuclear weapons. The Ribbon International was pleased to learn that the International Campaign to Abolish Nuclear Weapons (ICAN) was awarded the 2017 Nobel Peace Prize. 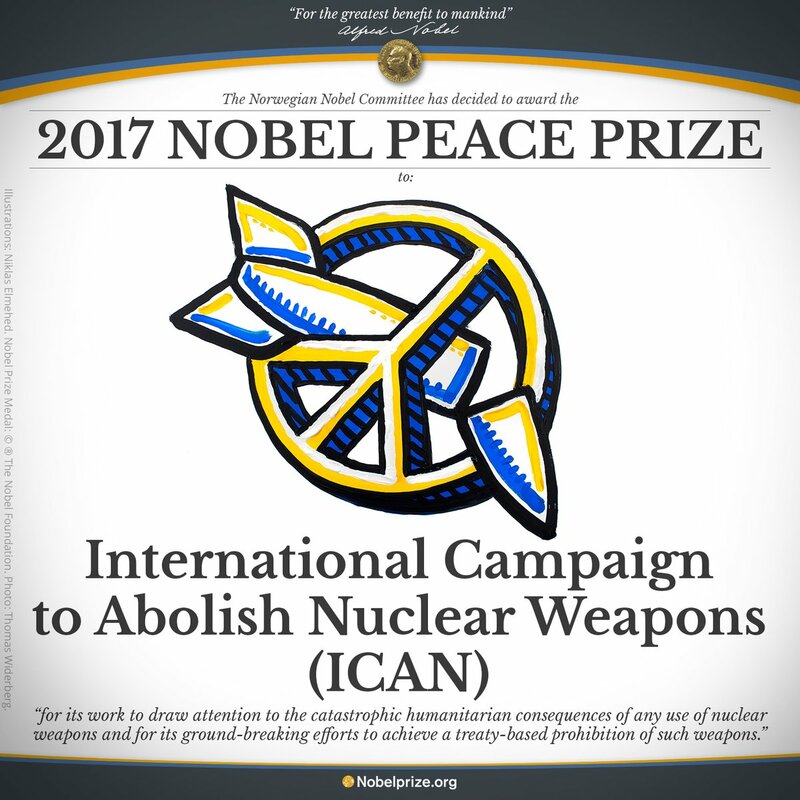 Abolition 2000 republished the statement of the Nobel Peace Prize Committee confirming to the award, "and we hope that this leads to early entry into force of the Treaty on the Prohibition of Nuclear Weapons." Juan Torres a senior high school student from Bayshore, NY, is The Ribbon International's new youth representative. Barb Gathard, one of our Ribbon committee members, gave a presentation at her local high school's Model United Nations class. 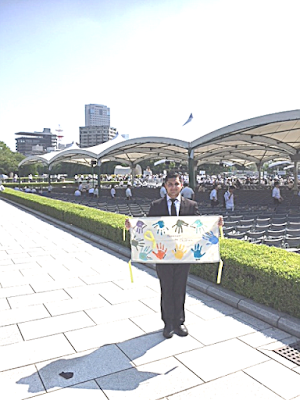 Juan was so impressed with her presentation, he offered to attend the annual Peace Memorial Service in Hiroshima, Japan on August 8, 2018,. OOSafewomb International Foundation, Nigeria, (OOSAIF). The Ribbon International display at the UN DPI / NGO Conference, August 22-23, 2018, "We the Peoples Together Finding Global Solutions for Global Problems" The United Nations has set a plan of "17 Sustainable Development Goals" to achieve by 2030. Ribbon panel "Remember the Children." UN Day for the Elimination of Nuclear Weapons. The Interfaith Prayer for Peace was read by participants as well. This prayer is often used at Ribbon joining events, such as the International Day of Peace, Sept. 21; special prayer days for places of worship, Memorial Anniversary for Hiroshima and Nagasaki nuclear bombing and other related events for peace, care of the environment and disarmament. 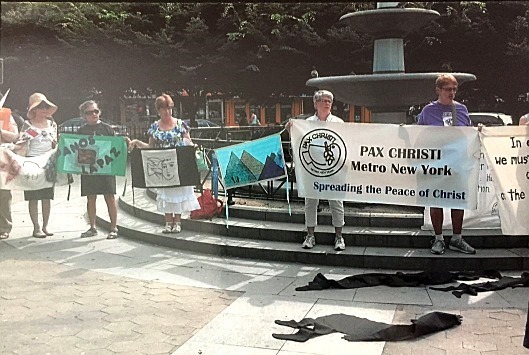 UN International Day for the Elimination of Nuclear Weapons, Sept. 26, 2018, Interfaith prayer service sponsored by Pax Christi Metro NY. 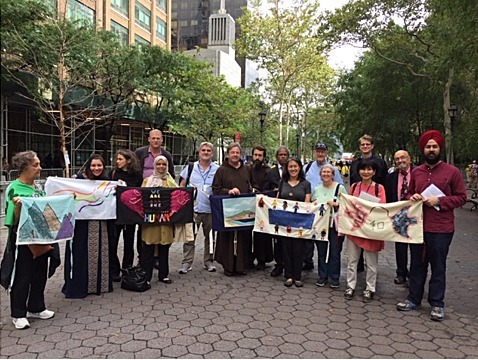 Event held at the Dag Hammarskjold Plaza, across the street from the UN, attended by Interfaith leaders and UN NGO representatives including The Ribbon International. Nicee Schneider, Dolores Schmitt, June Tano, Divjot Singh. The Ribbon Starting in California . (1985, 16:08 minutes, color) Video credit: Barbara Hirschfeld; Sonoma Chapter of Women's Action for Nuclear Disarmament (WAND) and KRCB.org – Channel 22 - Petaluma, California. 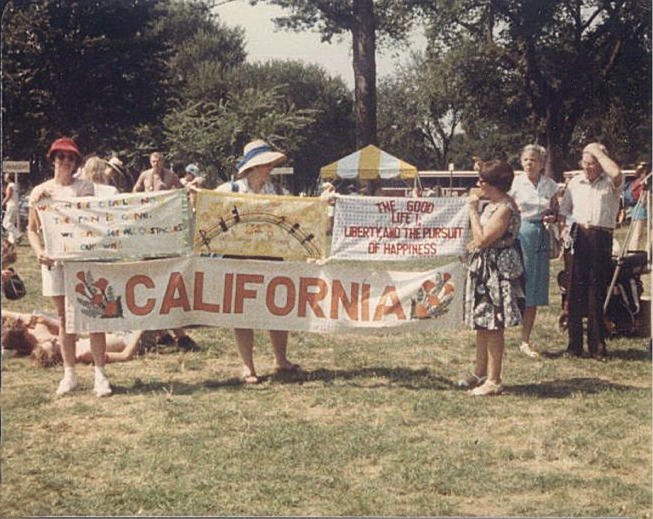 The early formation of The Ribbon in Santa Rosa, California with the Sonoma Chapter of Women's Action for Nuclear Disarmament (WAND), an interview with Liz Kenner Uribe; WAND Project Coordinator and with the California State Coordinator Audrey Keller, showing a display of The Ribbon around Lake Merritt in Oakland, California. 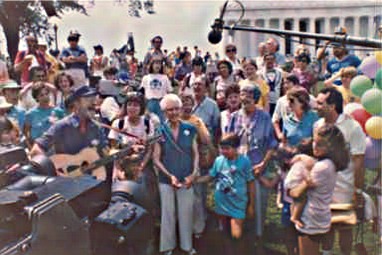 The Peace Ribbon - 1985,(28:37 minutes, color) Video credit: David Sabbath; WOUB Public Media; Ohio University Communications Center and the Ohio Art Council. 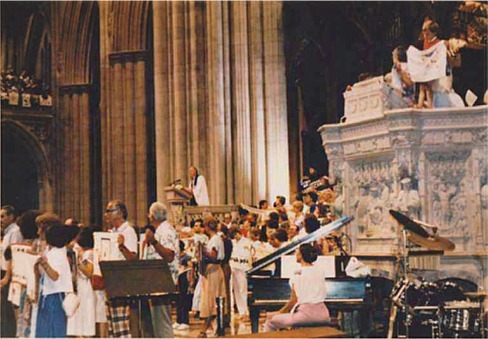 Coverage of the dedication ceremony of The Peace Ribbon / The Ribbon at the Washington National Cathedral in Washington, D.C. on August 3, 1985 and the 15 mile display of “The Ribbon” at the U.S. Capital Building, the National Mall and the Pentagon in Virginia, on August 4, 1985. The Ribbon In South Africa. 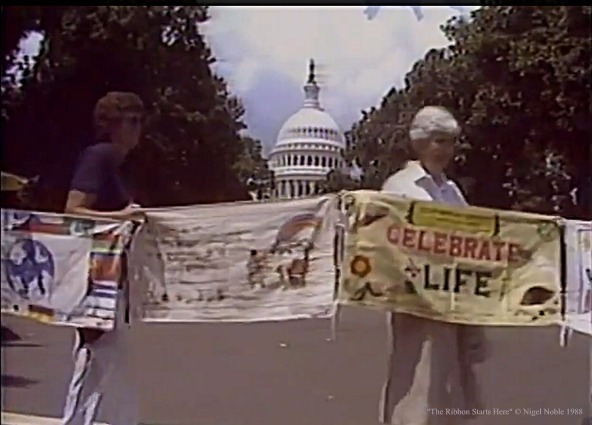 (1987, 50 minutes, color) Documentary video on how black and white mothers used the Ribbon project, creating panels and having Ribbon events in front of government buildings to protest their sons going to war and killing each other in South Africa. A film by Harriet Gavshon, in conjunction with the Co-operation for Development International, Ltd. (CDI). The Ribbon Starts Here. 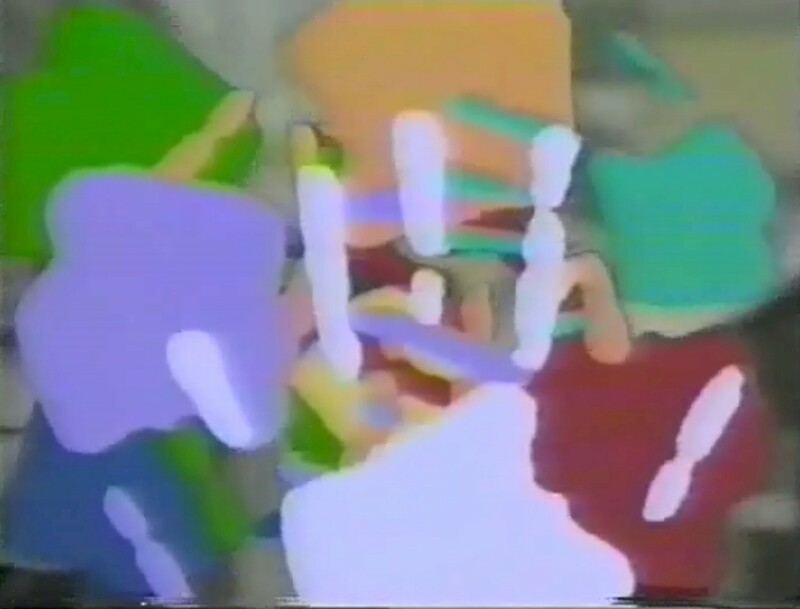 (1988, 45 minutes, color) Produced by Nigel Noble; Noble Enterprises. Gives a history of The Ribbon up to 1985 and interview with Justine Merritt the founder of the Ribbon. Zap To Peace. (1995, 50 minutes, color) A Ribbon fifteen kilometers (9.3 miles) long made by Arab and Jewish young people, and other children worldwide, to celebrate Peace Day and the United Nations 50 year anniversary. The land and ocean are lined with Ribbons, with the help of divers, panels are carried under water and join Egypt, Israel and Jordan. Segments are contributed by Switzerland, Norway, Germany, Italy, China and elsewhere. Israel Broadcasting Authority; Israel Television produced the video, Zap a youth television show led the campaign for months and televised the event along with news programs. Prime Minister Rabin and Prime Netanyahu are shown participating. Peace Ribbon Hiroshima: Witness of A-Bomb Survivors; Editor Miyoko Watanabe; first published in Japan by Peace Ribbon, 3-52-18, Koinaka, Nishi-ku, Hiroshima 733, Japan. Printed by Daigaku Printing Co. 809-5, Kamifukawa, Asakita-ku, Hiroshima 739-17, Japan, 1997. "Fibre Artist Hopes to Wrap Pentagon in Long Embroidered Ribbon That Transforms Ugly Fear Into Concrete Beauty." Fanning, Robbie. The Craft Report Dec. 1983, p.3. 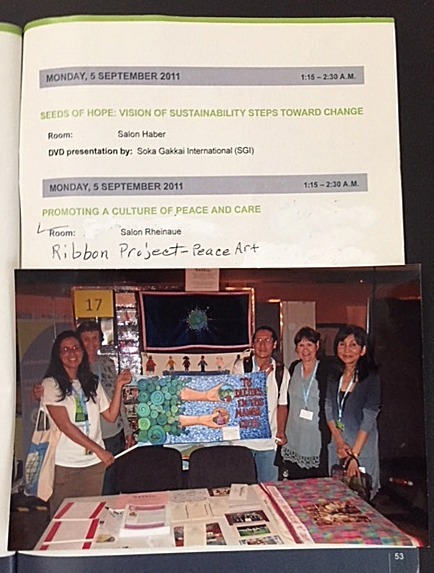 "Sew To Speak Is Theme For Ribbon For Peace." Quilters Newsletter Magazine Nov./Dec. 1984, p. 9. "Peace Ribbon Wraps Washington In Largest Collaborative Craft Event In American History." Wilcox, Don. The Craft Report. Oct. 1985, p. 10. "Works From the Heart: Home Sewers Unite To Tie Up the Pentagon." Levine, Adam Sews News June 1985, p. 33. "After the Ribbon." Fanning, Robbie Threads Magazine Dec. 1985/Jan. 1986, p. 12, 14. 1. Merritt, Justine. "Sowing Seeds". 2. Grogan, David and Chandler, David. "A Pentagon Ribbon for Peace". People Magazine. July 8, 1985 V. 24 (2). 3. Pershing, Linda, The Ribbon Around the Pentagon:Peace by Piecemakers. Knoxville: The University of Tennessee Press, 1996. 4. Wilcox, Don. "Peace Ribbon Wraps Washington In Largest Collaborative Craft Event In American History". The Craft Report. Oct. 1985, p. 10. 5. Caldicott, Helen, Missile Envy: The Arms Race and Nuclear War. Routledge New York 1984, p.21. 6. Jonathan Schell. "The Spirit of June 12" The Nation, July 2, 2007. 9. Harvey Klehr. Far Left of Center: The American Radical Left Today Transaction Publishers, 1988, p. 150. 10. 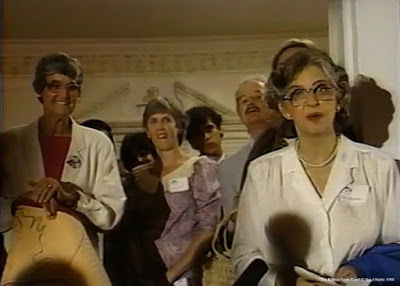 1,400 Anti-nuclear protesters arrested Miami Herald, June 21, 1983. 12. Kampel, Stewart. "A 'Ribbon' For Peace Unfurled On L.I.". New York Times - N.Y. / Region. March 3, 1985. 15. Weil, Dorothy. "Peace Packages Around The Pentagon". Cincinnati Magazine. November 1986. p. 155. 16. Jegen, Carol Frances Jesus the Peacemaker. Rowman & Littlefield, Jan 1, 1986, Page 63 - Google Books. 17. Moore, Willard Burgess Circles of Tradition: Folk Arts in Minnesota. Minnesota Historical Society Press, 1989, p. 17. 19. Jordan, Pat. "Three Who Went To Geneva To Be Heard At The Summit". Special to The Inquirer, Philly.com, January 05, 1986, Philadelphia, PA.
20. 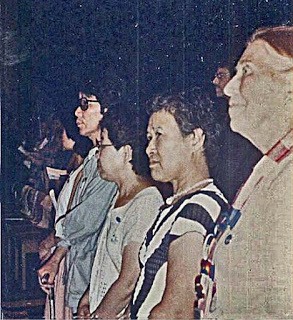 "Local Women To Participate In Peace Ribbon Event In D.C." The Sylva Herald & Ruralite - Jul 11, 1985, Sylva, N.C. p. 15. 21. Jackson, Nancy "Thousands participate in peaceful, silent plea". Editorials & Comments, The Gadsden Times - Aug 10, 1985, Gadsden, Ala., p. A4. 22. Peace Ribbon Project Northwest Ohio. Center for Archival Collections, Bowling Green State University, Ohio. 23. Mohr, Rev. Joseph, "Coalition Seeks Support Of Peacemakers Religion." The Morning Call. July 06, 1985, Allentown, PA.
25. Janzen, Victoria. 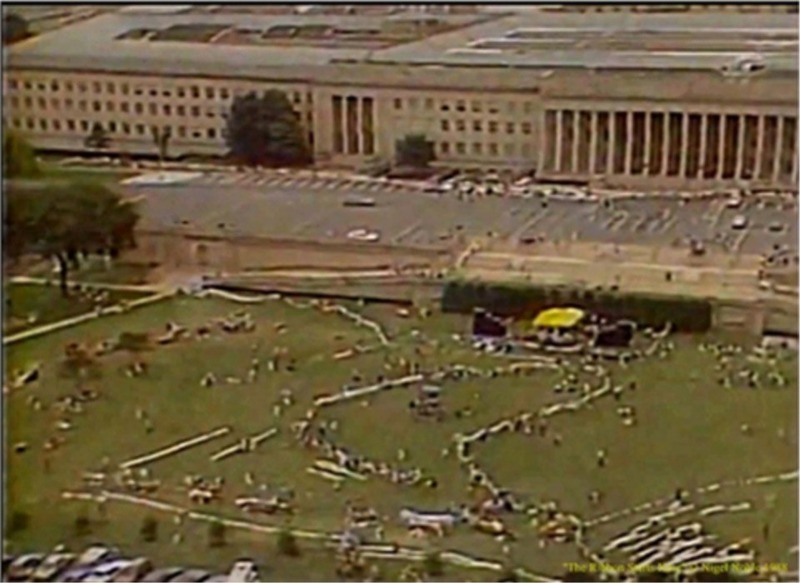 "Kansans and The Peace Ribbon Around the Pentagon in the 1980s". Mennonite Life, Summer 2010, Vol. 64. 26. Kingson, Jennifer A. "Ring Around the Pentagon: A Nuclear Frieze". The Harvard Crimson. February 8, 1985. Retrieved 2014-02-25. 27. "Pentagon Ceremony Aug. 4 Peace Ribbons in Oklahoma Called In". Oklahoman - NewsOK. July 20, 1985. 28. 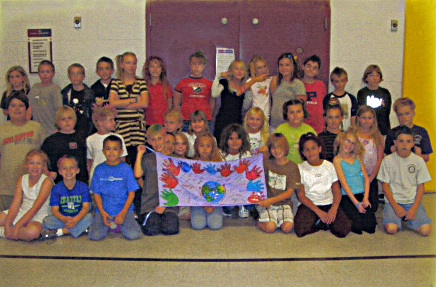 Peace Ribbon Project Northwest Ohio. Center for Archival Collections, Bowling Green State University, Ohio. 29. Kampel, Stewart. "A 'Ribbon' For Peace Unfurled On L.I.". New York Times - N.Y. / Region. March 3, 1985. 31. Steele, R. David. 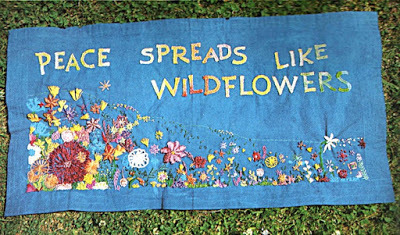 "The World Is Comin' to a Start - Peace Ribbon Brings Hope and and Community". Sequoia. Northern California Ecumenical Council, October 1985 p 3. 32. Biography of Annabel Hartman (Indiana Historical Society). 33. Sequoia. Northern California Ecumenical Council, October 1985 p 3. 35. Levine, Adam. "Works From the Heart: Home Sewers Unite To Tie Up the Pentagon." Sews News June 1985, p. 33. 36. "Sew To Speak Is Theme For Ribbon For Peace.". Quilters Newsletter Magazine. Nov./Dec. 1984, p. 9. 37. Fanning, Robbie. "After the Ribbon". Threads Magazine. Dec. 1985/Jan. 1986, p. 12, 14. 38. Rowley, James. "Group Plans To Stretch "Peace Ribbon" From Pentagon To Capitol Hill". Associated Press. August 2, 1985. 39. Washington, D.C., United Press International. "15-mile Ribbon Binds Anti-nuclear Marchers,". Sun Sentinel,. August 5, 1985 (Collections–Pentagon). 40. Gottlieb, Henry, Washington, D.C., Associated Press. "Thousands of Demonstrators Drape 'Peace Ribbon' Around Pentagon." Schenectady Gazette. August 6, 1985 (Front page). 41. Gemperiein, Joyce, KNT News Service Washington. "Demonstrators tie peace ribbon around pentagon." Lakeland Ledger. August 5, 1985, (Front page - A5). 42. Gerstenzang, James. "Thousands Tie 'Peace Ribbon' Around Capital". Los Angeles Times. August 5, 1985 (Collections). 43. Sanders, Steve. 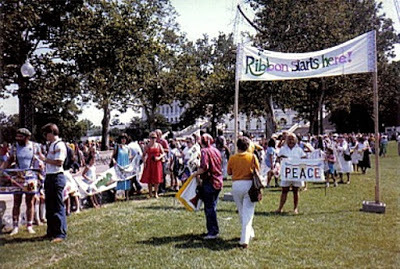 "Peace Ribbon’ Tied Around The Capitol". Chicago Tribune. August 05, 1985 (Featured Articles Lincoln Memorial). 44. Molotsky, Irvin. "Symbolic Ribbon Protests Nuclear Arms". New York Times. August 05, 1985. 45. Kernan, Michael. "Ribbon Around The Pentagon". The Washington Post. Sep 12, 1984, (Style - The Arts Television Comics B1). 46. Boscov, Rema, Special to The Washington Post. "Three Years of Peace Work". The Washington Post. Jul 16, 1985, (Style - The Arts Television Comics C7). 47. Hyer, Marjorie, Washington Post Staff Writer. "Prayers for Peace Interwoven". The Washington Post. Jul 27, 1985, (Style - The Arts Television Religion G10). 48. "Where to See Ribbon Segments". The Washington Post. 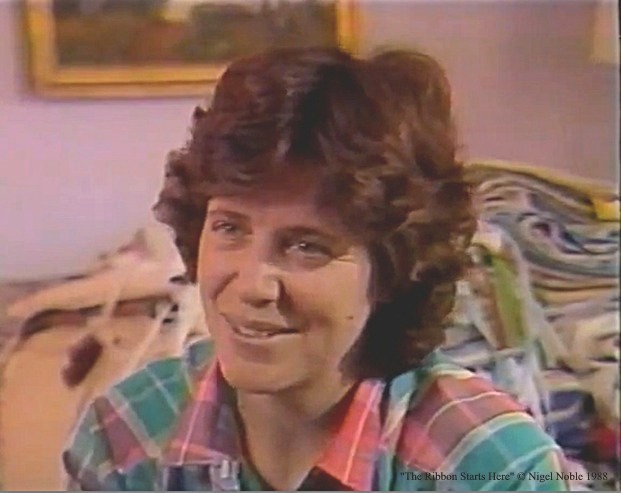 Jul 27, 1985, (Style - The Arts Television Religion). 49. Weil, Martin, Washington Post Staff Writer. "Police Say 15-Mile Peace Ribbon Won't Tie Up D.C. Traffic". The Washington Post. Aug 3, 1985, (STYLE - Metro Weather Obituaries Religion B1). 50. Pierce, Kenneth M. "This Could Be Ground Zero: Throngs recall the Bomb". "Also In This Issue" Time Magazine - U.S. Edition. August 19, 1985 Vol. 126 No. 7. 51. Saperstrin, Saundra. 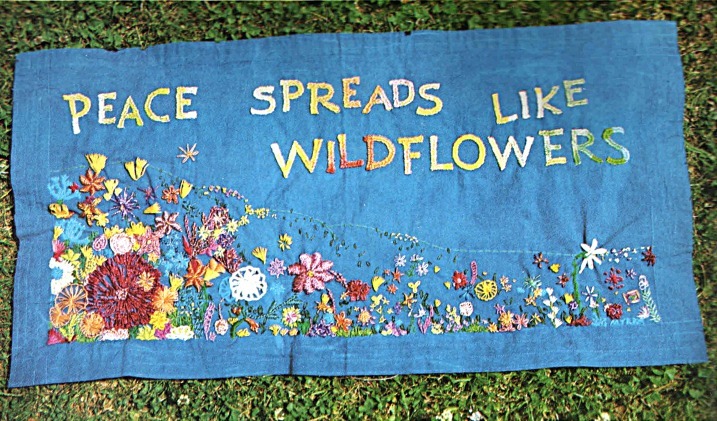 "Peace Lovers Have a Banner Day". The Washington Post. August 5, 1985 A1. 52. Kastor, Elizabeth. "The Dream Weavers". The Washington Post. August 5, 1985 B1. 53. McGrory, Mary. "Needling Warmakers". The Washington Post. August 4, 1985 B1. 54. The Ribbon Newsletter. October 1985, p. 3. 55. Hill Smith, Kim. "Ribbon of Hope" Dovetail. Vol. 1, No. 4, Fall 1985. 57. The Ribbon Embassies Link Up". Peacemeal (Newsletter 13). Nov./Dec. 1986 Wellington, New Zealand. 58. "NGO Committee on Disarmament, Peace and Security". 59. United Nations letter to Ms. Peppers from Angela Knippenberg, Chief of World Disarmament Campaign Section Department for Disarmament Affairs. Re: Ribbon Exhibit. Fourth Review Conference of the Non-Proliferation Treaty (nuclear weapons treaty conference) March 16, 1990. 60. To correspondents: From: United Nations Press Release News Cover Service. “Art Peace Project” to Honour Under-Secretaries-General For Public Information and Disarmament For Work to Advance United Nations Goals. Note No. 4909; February 6, 1991. 61. 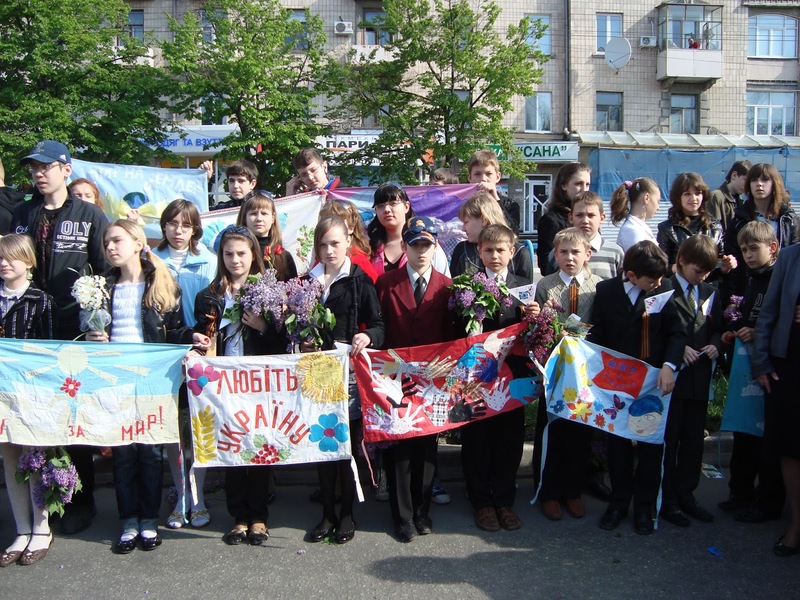 "The Ribbon International - Town Activity". 62. “Twin Cities United To The World Through Ribbons of Peace.” Twin City Journal-Reporter, Gas City, IN, October 9, 1996, p. 4. 63. Hevesi, Dennis. "Rabbi Bruce M. Cohen, is dead at age 64; Worked to promote peace". New York Times (Obit), August 8, 2010. 64. "Zap To Peace". 1995, 50 minutes, color. Israel Broadcasting Authority; Israel Television produced the video, youth television led the campaign and televised the event along with other news programs. 65. 1946 - The Early Days of the U.N. Inspire an International Legacy At Lehman. 69. Congressional Letters - Thank you letters. 70. Letters from Congress: To: The Ribbon International, from Michael B. Enzi, US Senator, “Thank you for Ribbon panel… Ribbon will be displayed in support of a year of peace and non-violence, especially for our children,” February 14, 2000. 71. Letters from Congress: To: Pauline Cantwell, from: US Senator Russell D. Feingold, “Thank you for the Ribbon, will be displayed in my office…” February 24, 2000. 72. Letters from Congress: To: Michele Peppers, from: Congresswoman Barbara Lee, “Thank you for the beautiful panel…I have it displayed so that visiting constituents to my Oakland office…” March 15, 2000. 73. Peppers, Michelle. 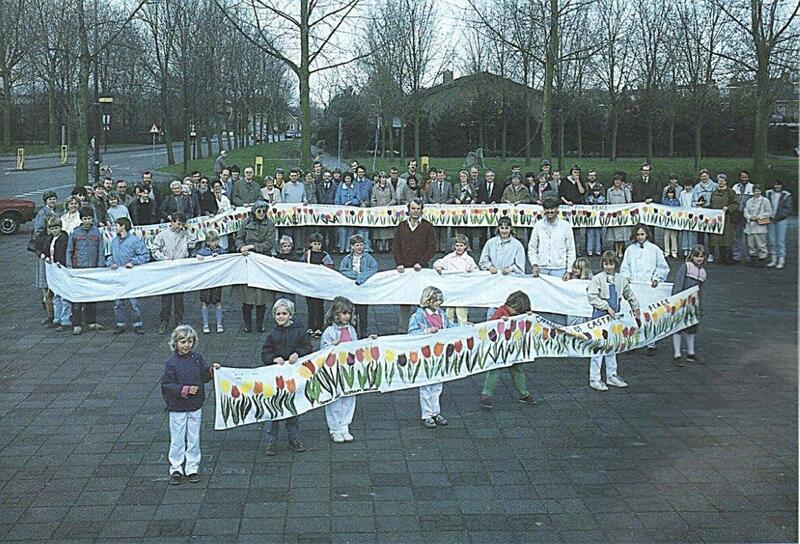 “The Ribbon is an Art Project Promoting Peace.” International Teacher – Post: a Peace Pedigogcal Newsletter Since 1982, No. 2, June 2011, p. 14, Teglgarden 8, DK – 4220 Korsor. (ISSN 1396-8580). 74. Reynolds, Mary. “Sewing Up the Project.” Today’s News-Herald, Lake Havasu, AZ, v. 35, (189) September 26, 2000, p. 1. 75. Roshan, Sorosh, Editor et al. 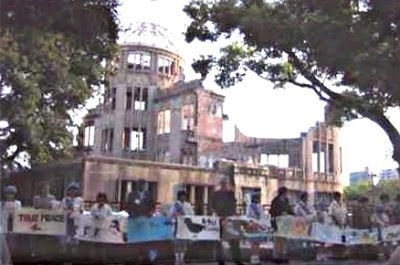 “Peace Ribbons at Atomic Bomb Dome.” International Health Awareness Network, Spring 2006, p. 2. 76. Bussell, Lynne, Editorial Team, Newsletter Committee. 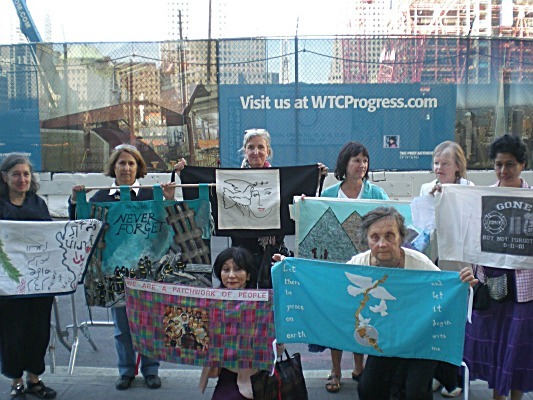 "2006 Ribbon Joining at the United Nations WTC". Church Women News, Vol. 1, (3) June 2006, p.8. 77. "National September 11 Memorial & Museum". 78. "Building a Just and Sustainable Peace," Hiroshima Peace Conference. 83. Press Release NYC Chapter of Veterans for Peace-Invitation - Media Advisory - Peace Gathering to Commemorate 70th Anniversary of Hiroshima and Nagasaki.